One of the UK’s most prominent think tanks told a prospective donor they could discreetly influence a report in ways that could advance their business interests, in exchange for £42,500. 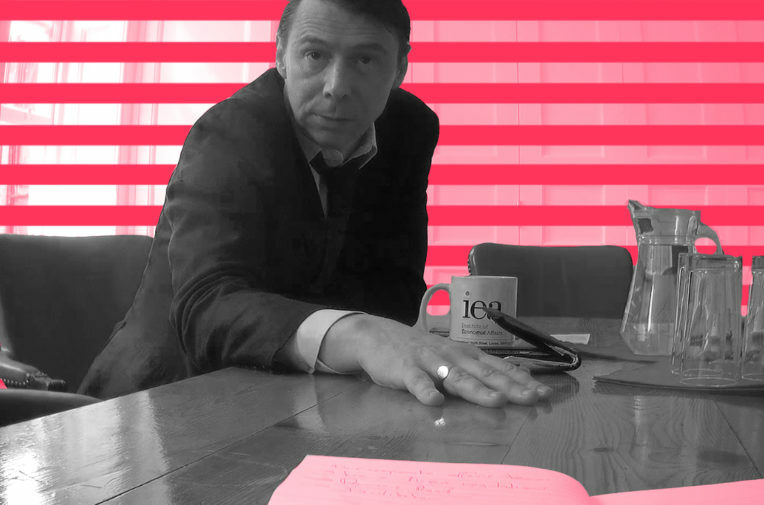 The head of the Institute of Economic Affairs, Mark Littlewood, told an undercover reporter posing as the representative of a US beef investor that funding the report on what “green Brexit” means would ensure it prominently featured the donor’s concerns. He made the offer despite the IEA telling the Charity Commission its research is independent from corporate sponsors. Littlewood told the undercover reporter that funders were not able to change the conclusions of IEA research, but they could influence the “content” and “salience” of issues within the paper. He also suggested the funder would be able to attend a private dinner with its author Matt Ridley – a prominent climate change sceptic and advocate of controversial neonicotinoid pesticides – and potentially with Gove, the environment secretary, or another minister. Littlewood said Gove was keen for the report to happen. Gove has promised a “green Brexit”, with even stronger animal welfare and environmental protections than the EU’s. European environmental rule-making follows the precautionary principle, under which products and methods must be proven to be safe before they can be introduced. Littlewood suggested the report could be counted on to argue that the EU’s precautionary principle should be dropped – a longstanding goal of Ridley’s – and that beef reared to US standards should be allowed into UK supermarkets. Many American beef products cannot currently be imported to the UK, because of an EU ban on hormone-reared beef. The IEA director told the undercover reporter: “[T]here is no way this report is going to say the most important thing we need to do is keep American beef out of our market in order to prop up our beef farmers, in fact exactly the opposite”. Littlewood said Ridley had discussed the report, on innovation in agriculture, with Gove, who he said was enthusiastic about getting the ideas into the “bloodstream of Defra”. “Yeah, he told Matt Ridley, it would be really good if you guys could get these ideas out there,” he said. He said the paper would examine what is really meant by “green Brexit” – a term coined by Gove. A spokesman for Gove told Unearthed: “The government and the environment secretary have been very clear that food safety and animal welfare standards will not be weakened after Brexit. “We will never be swayed on this. There will no chlorinated chicken entering the UK and we will retain the precautionary principle. That position won’t change whatever any think tank recommends,” he continued. “But what’s more worrying is Michael Gove’s apparent enthusiasm for a project authored by a leading climate change sceptic whose love of dangerous pesticides is well-documented. If the Government wants research-backed policies, ministers would do well to rely on their own independent civil servants,” she continued. The IEA, which is registered as an educational charity, does not disclose its donors, arguing that it is under no moral or legal obligation to do so. In 2016, the charity’s trustees told the regulator it only accepts research sponsorship from “individuals or trusts who do not have a vested commercial interest in the topic”, the Charity Commission wrote. “[T]he trustees take considerable efforts to ensure that whatever the source of funding, IEA’s research is independent,” the commission wrote. But Littlewood suggested donors’ interests could help shape its reports. He added that the IEA does not let donors change a report’s conclusions, but confirmed that there would be prominent “substantial content” covering their areas of interest. “The IEA is currently working on a report on agricultural innovation, which was commissioned prior to the meeting outlined. As previously mentioned, we would carry out this work regardless but obviously do fundraise to cover the production and distribution costs of our output,” she continued. The proposal for the IEA study – which is marked “strictly private and confidential” and published by Unearthed here – echoes another report on innovation in agriculture published in November by UK2020, a think tank run by Ridley and his brother-in-law, the former environment secretary Owen Paterson MP. UK2020’s paper argues that restrictions on chlorinated chicken, hormone beef and GMOs should be dropped post-Brexit and biodiversity offsetting introduced. The report recounts how that Paterson hosted Gove on an agricultural tour of his North Shropshire constituency in October, where the environment secretary was introduced to some of the ideas in the UK2020 report.